HOTROD I f recent studies are true, we work in a transient world. Research suggests that most people in business today will hold about a dozen different jobs over the course of their career. Thankfully, no one thought to tell Ralph Morey about that. 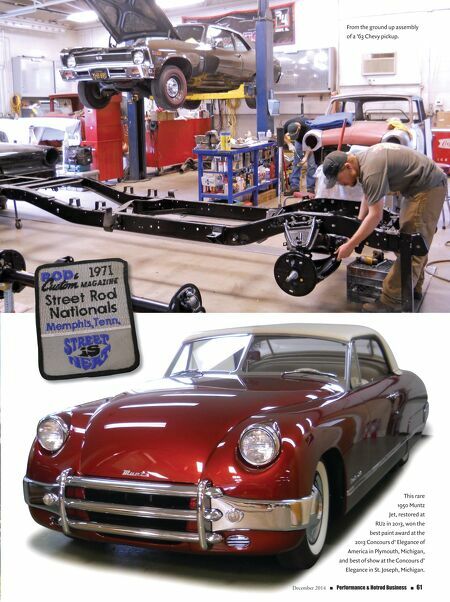 Since April of 1971, Morey has been the visionary owner of Cary, Illinois-based Restorations Unlimited II In c o r p o r a t e d ( R U 2 Inc.), and his custom- ers reap the benefits of his more than 40 years of experience on an almost daily basis. Along with his brother, Raymond, and a team of five other longstanding employees, Morey has specialized in full body-off restorations of the highest quality. In the process, he's built a reputation in high-end vehicle circles around the country. An Accident? It's hard to think that it almost happened by accident—if you believe that anything of that sort does happen by accident. "As a young kid I always had an interest in cars, but I didn't know anyone in the business so I never really thought that a career restoring classic and antique cars was even an option," laughs Morey. "But I went to a school to be a machinist and one of my first jobs was with Monogram Models as a mold maker, duplicating famous custom cars for their scale model kits." Morey promptly got a job with a restoration shop, where he cut his teeth in the automotive world while making plans to open his own shop. He finally took the leap in 1971, opening up in a small space of his own in nearby Fox River Grove, Illinois. 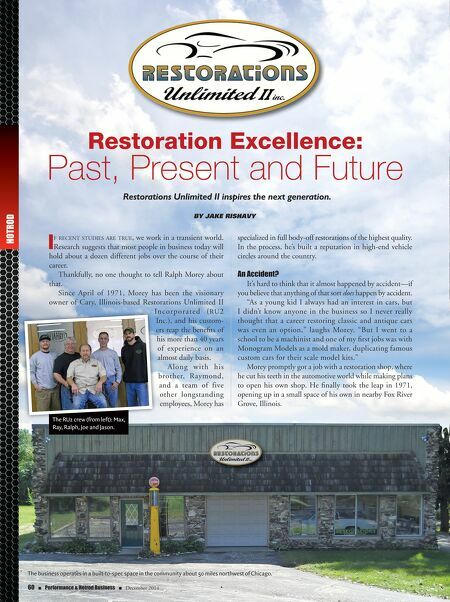 Restoration Excellence: Past, Present and Future Restorations Unlimited II inspires the next generation. 60 n Performance & Hotrod Business n December 2014 The business operates in a built-to-spec space in the community about 50 miles northwest of Chicago. By Jake Rishavy The RU2 crew (from left): Max, Ray, Ralph, Joe and Jason.